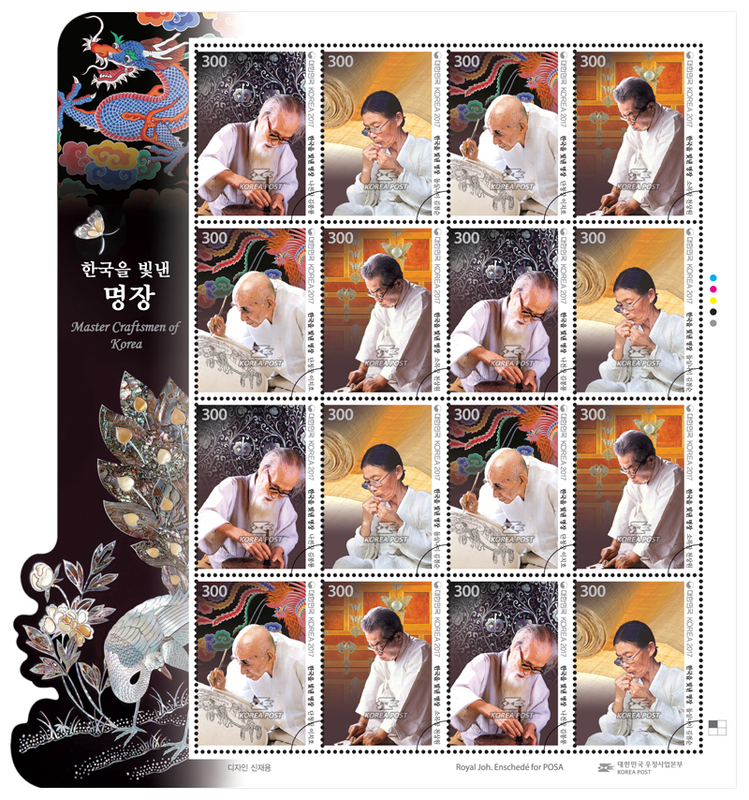 Korea Post is issuing commemorative stamps featuring four master craftsmen recognized by the government for ability to produce National Intangible Cultural Heritage. These artisans worked in traditional crafts for decades a nd made great contributions to the preservation of Koreas beautiful cultural heritage. Kim Bong-ryong (Jan. 3 0, 1902 to Sept. 2, 1994) was a master of najeonjang (mother-of-pearl Inlaying), which is National Intangible Cult ural Heritage 10. This native of Tongyeong first learned najeon lacquer work at the age of 17 and later acquired new techniques. He soon after became renowned as he won awards at many international and local expositions and exhibitions between 1924 and 1934. His works featured delicately cut mother-of-pearl in bright colors that c ontrasted with the dark lacquer applied. He added arabesque designs to dragons or phoenixes, giving the traditi onal method a modern touch. 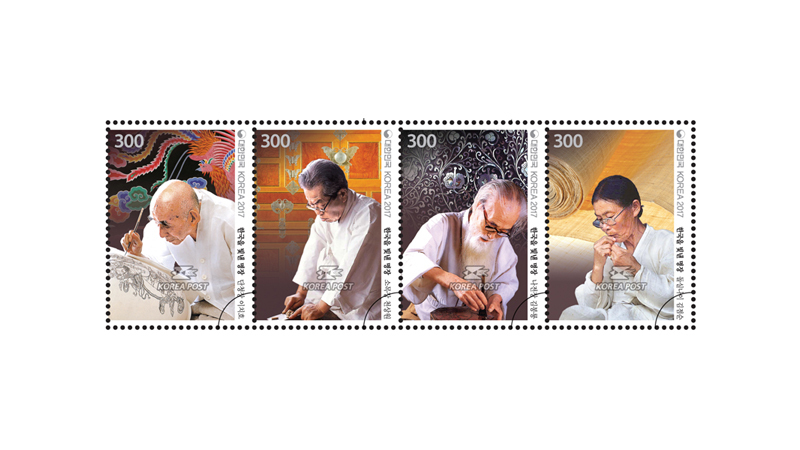 Kits Jeom-sun (Aug. 2, 1918 to Feb. 5, 2008) was a master craftsperson of Gokseo ng dolsillai (hemp-weaving of Gokseong), which is National Intangible Cultural Heritage 32. Dolsillai is a process of producing hemp cloth by splitting hemp stalks into strands of thread. Her hometown of Seokgok-myeon, Gok seong-gun, Jeollanam-do has long been known for producing quality hemp cloth. The term dolsillai is a combin ation of dolsil, the old name of the town, and nai, an old word referring to weaving. Kim Jeom-sun was recogniz ed for her exceptional skill in producing fine threads and exquisite weaving works. Lee Chi-ho (Oct. 4, 1910 to M ay 17, 2006, Buddhist name Manbong) was a master craftsman of dancheongjang (ornamental painting), National Intangible Cultural Heritage 48. Under the tutelage of Monk Kim Ye-un, he inherited and developed the styles of traditional Buddhist art since the age of 14. He produced images of Buddha for worship and Buddha painting s for Buddhist education, as well as traditional multicolored paintworks on wooden buildings. His works are disti nct in that they incorporate modernistic expression featuring bright colors and auspicious elements on traditions I materials. Cheon Sang-won (Sept. 15, 1926 to Mar. 13, 2003) sass master of somokjang (wood furniture makin g), which is National Intangible Cultural Heritage 55. Born in Tongyeong, he learned somokjang skill from his fat her, artisan Cheon Cheol-dong. Cheon Sang-won was particularly skillful in bringing out the natural beauty of th e grain of wood when making furniture including chests. He was also widely known for adding a81 pattern to hi s furniture in inlay.